In this week’s Big Ten Tournament edition of our Power Rankings we look at Michigan’s woeful post defense, DJ Newbill’s dominant isolation game, Frank Kaminsky and find the Big Ten’s best off the dribble shooter and ball screen passer. Welcome to our Big Ten Power Rankings where we examine the conference on a weekly basis and attempt to rank all 14 teams and provide a bit of insight. In honor of the Big Ten Tournament, we’re listing each team’s log5 percentage chance of winning the tournament in Chicago this week. Find the Big Ten Tournament bracket here. 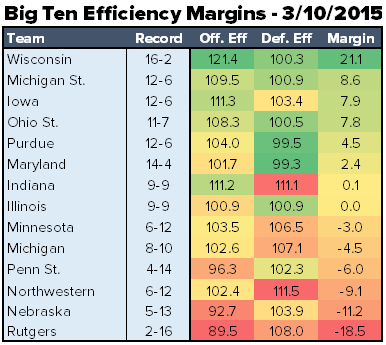 According to the efficiency margin numbers, Wisconsin was the most-dominant Big Ten Champion since Illinois went 15-1 in 2005. But somehow the Badgers only won the conference by two games, a game less than Michigan won the league by last season. 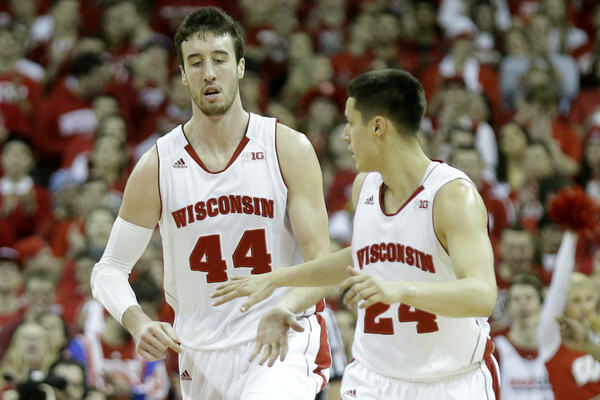 It’s no secret that the Badgers were led by the conference’s best player, Frank Kaminsky. 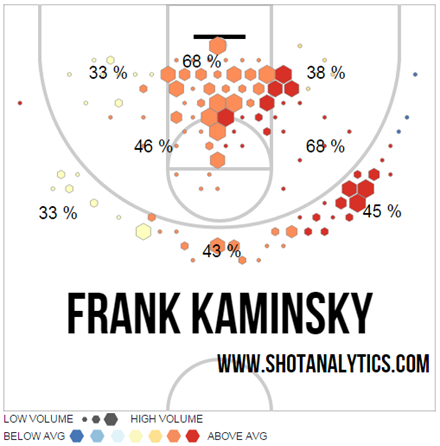 Tom Izzo went as far as calling Kaminsky the most-impressive player in the conference since Glenn Robinson. 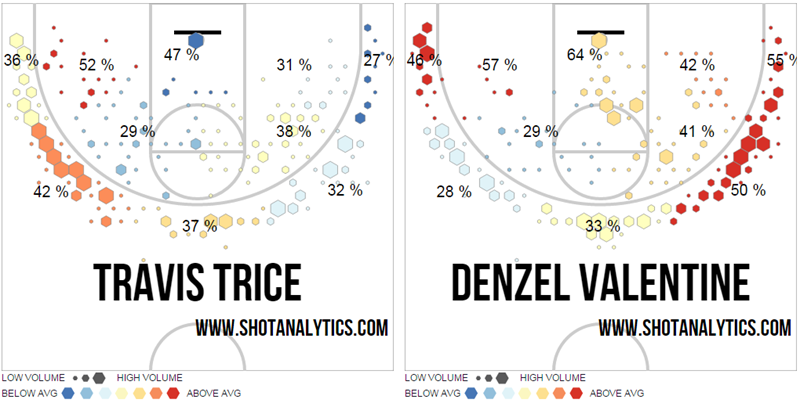 His shot chart is impressive, not just because of how efficient he is but because he knows where to pick his spots. Kaminsky loves the pick and pop game on the right wing and the top of the key and then he’s dominant on the low block and around the basket. Maryland reminds me a lot of the 2011-12 Michigan team that shared the Big Ten Championship with Michigan State and Ohio State. 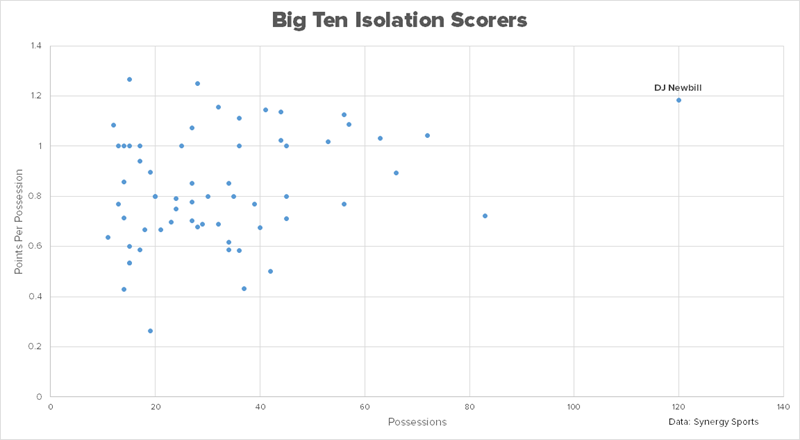 That team shared the Big Ten crown despite outscoring its opponents by just 5.9 points per 100 possessions. That performance earned Michigan a 4 seed and an upset loss to Ohio University. Maryland outscored its opponents by just 2.4 points per 100 possessions, meaning the Terps should have been closer to .500 than second in the league. That’s a testament to Dez Wells, Melo Trimble, Mark Turgeon and the rest of their program, but it’s also a huge red flag from here on out. Being able to win close games is great, playing in a lot them isn’t. Iowa officially put last year’s nightmare collapse behind it and closed this year’s Big Ten season strong. The Hawkeyes have won six in a row and while they didn’t earn the double-bye, they did play the toughest conference schedule among the six Big Ten teams that finished with a winning record. Purdue’s Rapheal Davis won Big Ten Defensive Player of the Year honors on Monday and his teammate AJ Hammons, with his league leading block rate, could have made an equal argument to the claim. 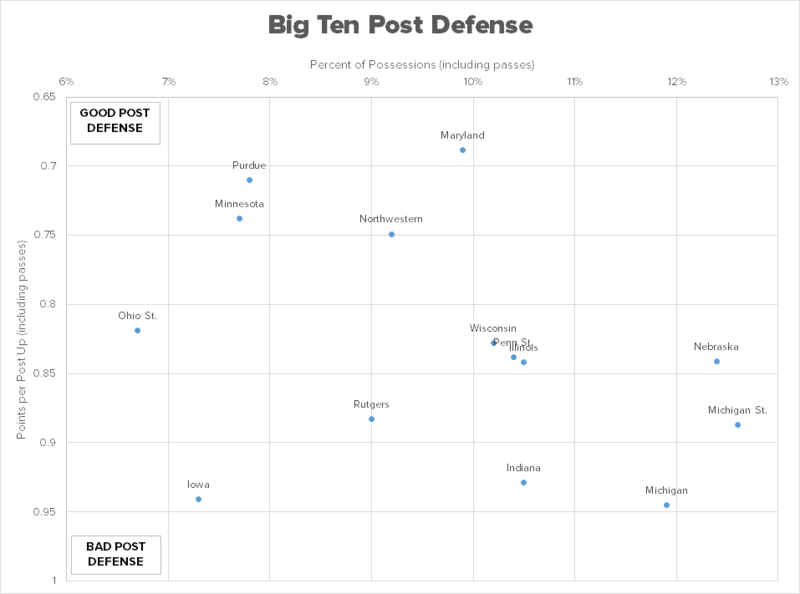 Purdue finished with the second best defense in the league and there were no tricks to its approach. The Boilermakers were ranked 9th or worse in forced turnover rate, defensive rebounding and foul rate, but allowed a league-best 42.4% on twos, 32.2% on threes for a 44.2 eFG%. D’Angelo Russell is blessed with many talents, but one that we haven’t discussed yet is his efficiency shooting off the bounce. Russell is the Big Ten’s best shooter off the dribble with at least 75 attempts and he’s ahead of the pack by a wide margin. Illinois probably needed one more win over the last month to feel comfortable about its NCAA tournament chances and will have to beat Michigan on Thursday to keep those hopes alive. The last two meetings between the Wolverines and Illini both featured dramatic home comebacks leading to overtime wins. Michigan had just a 6.5% chance of winning in Ann Arbor when it trailed 48-35 with 11:23 to play in the second half while Illinois had a 7.7% win probability when it trailed 50-43 with 3:12 to play in Champaign. After starting 5-1 in Big Ten play, Indiana won just four of its last 12 games this season. The four wins were over Rutgers (twice), Minnesota and a Michigan team playing without its starting guards. It was a rollercoaster season for Tom Crean who was under fire early in the year due to off court transgressions and then earned heavy praise after a 15-4 start. Now the Hoosiers probably need a big weekend in Chicago to make the NCAA tournament and I’m not sure Crean can survive missing the tournament in back-to-back years. Who has assisted the most points off of a pick and rolls this season? Not Melo Trimble, Yogi Ferrell, D’Angelo Russell or any of the other big name point guards that you would expect. Try freshman guard Bryant McIntosh, who earned a well-deserved spot on the All-Big Ten Freshman team this season. Michigan thumped Rutgers on Saturday, but also lost a devastating double-overtime thriller at Northwestern. The loss in Evanston had enough late drama for an entire season, but Michigan’s biggest problem wasn’t anything new. Alex Olah dominated the game on the block as Northwestern exploited Michigan’s conference-worst low post defense. DJ Newbill was a great representative of the Big Ten (catch his BTN Journey Senior Day segment if you can find it) and he’s been one of the league’s elite isolation scorers for several years. 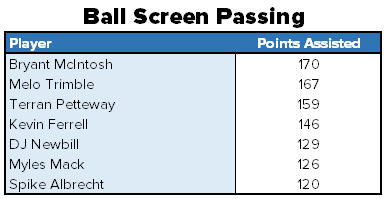 In the words of John Beilein, Newbill is a true ‘Philly guard’ with his ability to just take people off the dribble. He couldn’t have gone out in a more fitting fashion that burying a game winning three at the buzzer in Minnesota. 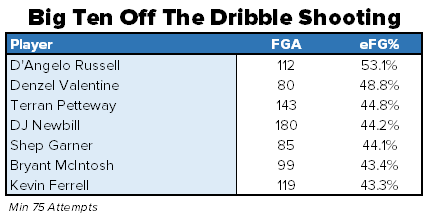 It’s no secret that Newbill is great off the bounce, but look at how dominant his isolation game was compared to the rest of the league. Richard Pitino was known for his aggressive, trapping defensive system when he was hired at Minnesota. His two teams in Minneapolis have both finished the Big Ten season with defenses ranked in the bottom third of the league. This year the Gophers did force turnovers, leading the league with a forced turnover rate of 21.6%, but it was for naught. Minnesota allowed the worst eFG% (53.1%) and worst offensive rebounding rate (33.4%). 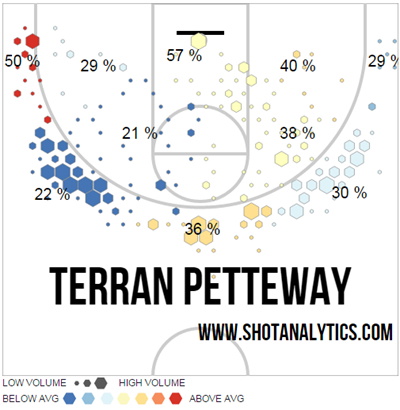 Nebraska had as disappointing of a season as anyone in the Big Ten, but somehow Terran Petteway still earned a spot on the All-Big Ten Third Team. Petteway has always been a high-volume shooter, but according to numbers at Shot Analytics – which uses a formula to compare expected value of Petteway’s shots compared to his production – he was the third worst shooter in the conference. Welcome to the Big Ten, Rutgers. I’m not sure we’ll ever figure out how Rutgers beat Wisconsin two months ago, even without Frank Kaminsky and Traevon Jackson, but we saw the real Scarlet Knights over the last two months. Rutgers finished its season finale at Michigan on a 19-0 run, but still lost by double digits to keep its 14 game losing streak alive.